Another year and this time we really thought that the last of the well – actually very well hidden Easter Eggs had been found…but they magically keep appearing. 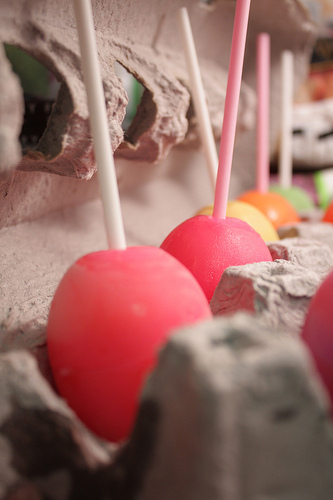 Rather than packing them away we are making Egg Pops, a “cool” idea from Kailo Chic using our plastic eggs and just plain fruit juice. First tip the eggs upside down and poke three holes in the bottom. Two of these holes are for letting the air escape when filling the egg, the third one should be in the center of the bottom. Make this center hole bigger using the large nail. You will need it to be as big as the popsicle/sucker stick. 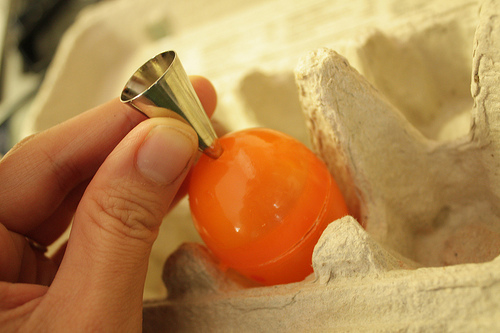 Once that is done, and you have your egg carton full of eggs, use the piping tip to fill each one until almost full. Then poke in the popsicle stick and place in the freezer until firm. What do you do with your left over plastic Easter Eggs? Please share your good ideas.